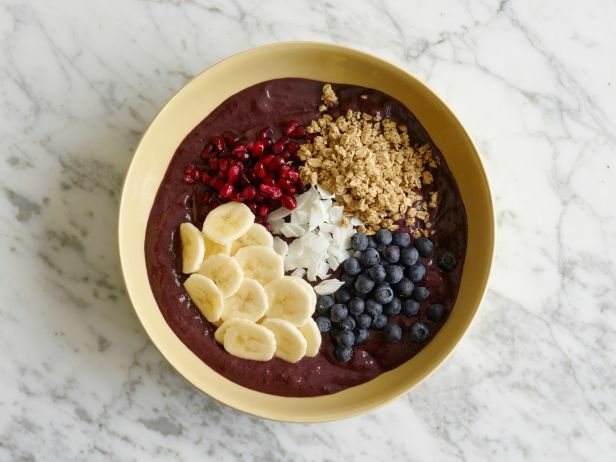 Break the frozen acai up a little by slapping the sealed packets on the countertop or hitting them with a meat mallet. Blend the berries with 1/2 the banana, 1/4 cup of the blueberries and the honey in the blender, stopping to stir and break up the mixture as needed, until it’s the consistency of a thick smoothie; transfer to a cereal bowl. Slice the remaining 1/2 banana. Arrange the slices, the remaining 1/4 cup blueberries, granola, pomegranate seeds and coconut flakes in neat piles or rows on top of the acai. Then take a photo!